Come enjoy free food and fun with the Albuquerque Police Department. APD's Northeast, Foothills and Southeast area commands along with surrounding businesses and neighborhood associations are hosting a joint officer and community appreciation day. 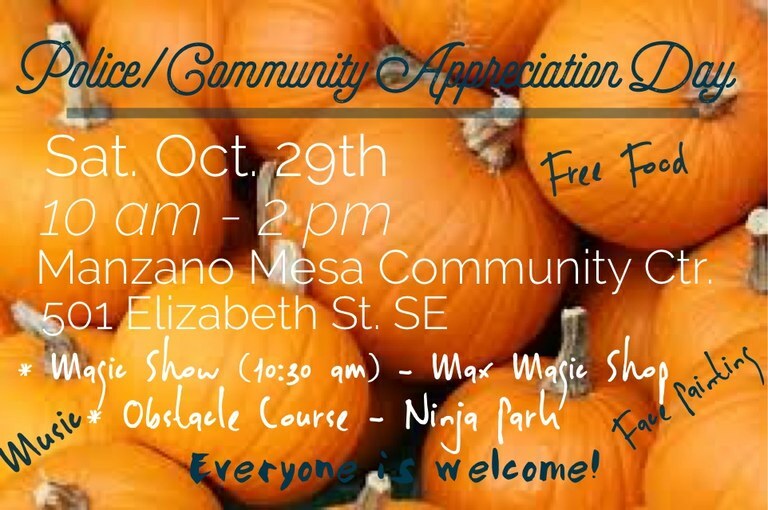 Location: Manzano Mesa Multi-generational Community Center - at 501 Elizabeth St. SE. The event will run from 10:00 am to 2:00 pm. There will be free food, music, and lots of family fun. Attractions include bouncy houses - a rock wall provided by the National Guard - a Ninja Wall provided by Ninja Core - and a magic show promptly at 10:30 a.m. provided by Max's Magic Shop.